We provide licensed, Title XIX and NFPA 25-compliant fire systems inspection,testing, and certification services for all fire protection systems. 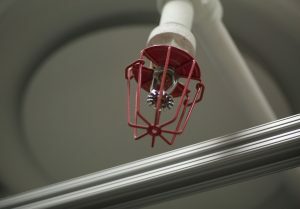 We also test and certify fire sprinkler pre-action systems and foam systems. Regardless of the type of fire safety system you have, A-Total Fire Protection has the knowledge, experience, necessary equipment, and paperwork to complete your fire safety services quickly and professionally so you can get on with your business with as little inconvenience as possible. Why choose A-Total Fire Protection? We’re open Monday-Friday, 8am-4:30pm. Our friendly and knowledgeable fire protection staff is always here to help you find the answers you need, walk you through our easy bid estimate process, or to schedule your fire safety inspection, fire protection system inspection, 5 year sprinkler certification, or other services to best match your circumstances. For buildings with pressure regulated valves, we have engineered a portable tank that rolls throughout your building for testing. This eliminates the liability for damage caused by running hoses from the top of the building to the bottom floor.We do 99% of deficiencies in-house.We have a fire engine of our own for pumping dry standpipes during testing. If you feel that your circumstances are unique, just ask! We have over forty two years of experience in the business! We carry all necessary insurance that your company may require of us, so in the event that something does get damaged you are covered! We are more than happy to provide proof of insurance upon request. A-Total Fire Protection will co-insure, and send you a certificate of valid insurance.